A single-player word tiles board game. 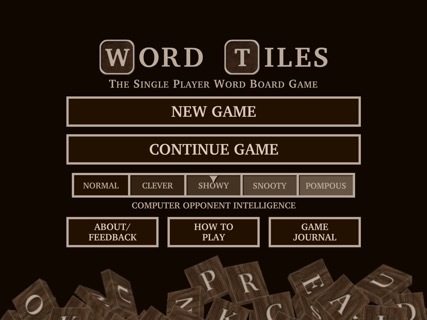 Word Tiles is a single-player word tiles board game, similar to many others (compare to games like Scrabble or Words With Friends). Since you play against the computer, there's no need to wait for your friends to make a move. Play as fast and as often as you like! 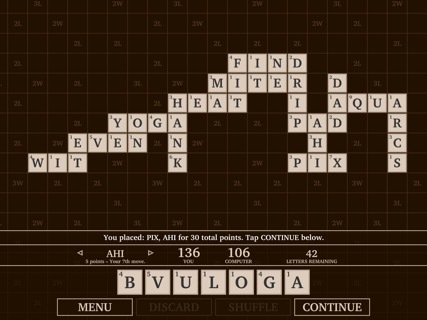 While playing you can zoom in or out to adjust the size of the letters on the board. You can flip through a list of all words played and how much each was worth. You can also see how many potential points a move is worth before finishing your turn. Unlike physical board games, Word Tiles has no limit to the board size. You can the computer can keep adding words to the left, right, top or bottom as long as there are letter tiles remaining. You can also return to the main menu at any time and adjust the computer's intelligence setting. There are five computer intelligence levels to choose from. 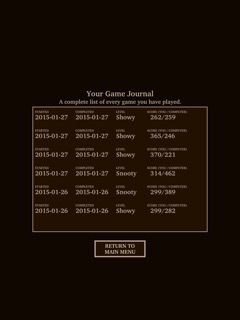 When you complete a game, a record of the score is placed in a journal so you can track your progress as you improve.